Summer has officially arrived! The temperatures topped 90° and the sun was shining bright yesterday. We’re lucky enough to have friends who live in an apartment with a gorgeous rooftop we can enjoy on nice days and we finally got together with them last night. The lovely hosts were in charge of dinner, and Brian and I were on dessert duty. There was just on problem with this plan: It’s been a busy week and we didn’t have time to whip something up and I was unsatisfied with the desserts I checked out at a bakery during the day. We were running out of time and needed to act fast. I considered picking up some ice cream or gelato, but didn’t think that seemed special enough. 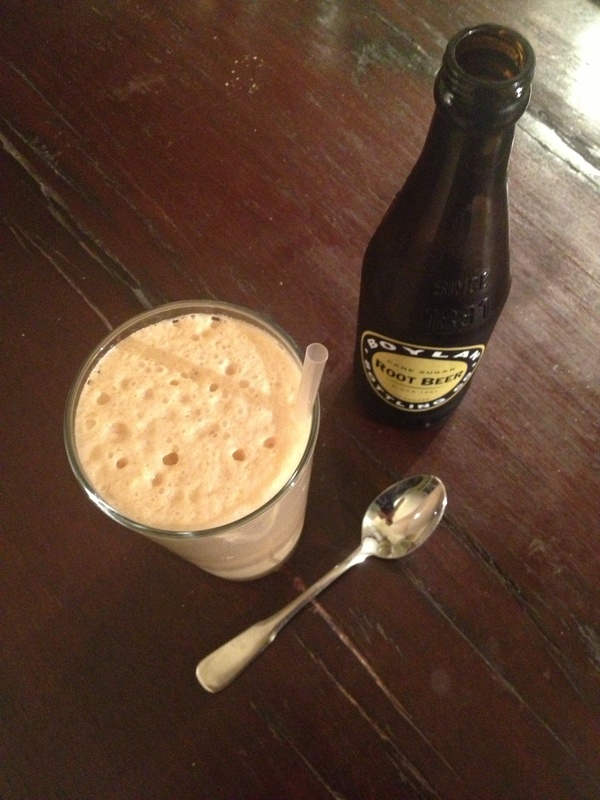 And then the perfect idea hit me: boozy root beer floats! We were able to get all of the ingredients from a corner store near their place, making this a perfect grab-and-go option for a busy weekday. We may just have to put this idea on repeat. 1. Put a scoop or two of gelato into a tall glass. Top with a shot of whisky and serve with a bottle of root beer.